Please note that the content of this book primarily consists of articles available from Wikipedia or other free sources online. Elections for the 16th Knesset were held in Israel on 28 January 2003. The result was a resounding victory for Ariel Sharon's Likud. The previous separate election for Prime Minister was scrapped, and the post was returned to the leader of the party successfully forming the working coalition government. Elections in Israel are based on nationwide proportional representation. 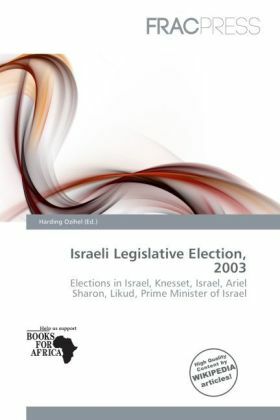 The electoral threshold is currently set at 2%, with the number of seats a party receives in the Knesset being proportional to the number of votes it receives.